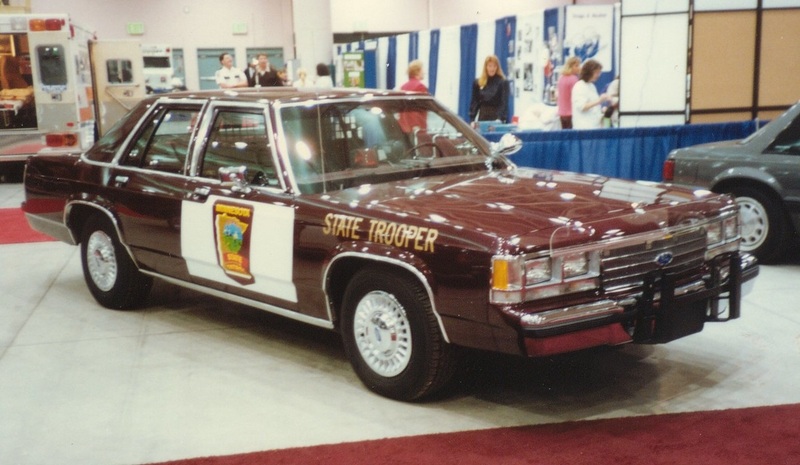 Only about 80 new cars were purchased by the State Patrol in 1991; all of them maroon Ford Crown Victoria Police Interceptors. The 5.8 liter V-8 with variable venturi fuel delivery was virtually identical to the power plant used in the ’82, ’84, and ’85 Fords. These were the last MSP cars to have the white doors... for a while. Changes in body styles, a need for greater visibility and advances in vinyl graphics caused many agencies to rethink their vehicle designs in the early 1990s. The Minnesota State Patrol was no exception. Work was underway to develop a graphics package that would not only continue a strong link between tradition and the future, but also provide for trooper safety through rapid identification and the introduction of side reflectivity. The design had to be an aesthetically strong complement to the shape and design anticipated for vehicles over the course of the next decade. The design had to be cost effective and in compliance with Minnesota Statutes regarding color and marking of police vehicles. In the end, it came down to a choice between the two designs shown in the artists’ renderings above. It becomes obvious through the photos on this page which design was selected. 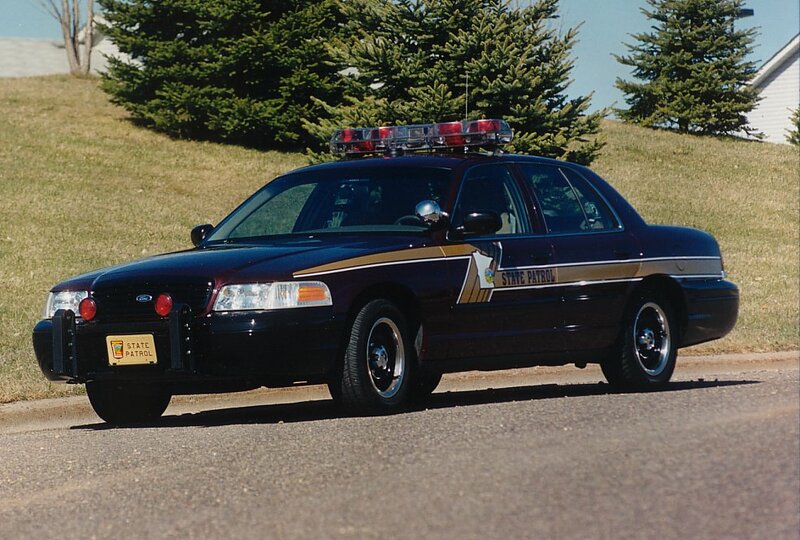 After a few revisions, the new design from the Grafix Shoppe of Eagan, Minnesota, was applied to the Ford Crown Victoria Interceptors and other vehicles beginning with the 1992 model year. For 1992, the Ford Crown Victoria P72 took on a whole new look. New from the ground up, the Interceptor package included an all new 4.6 liter 210 hp modular port fuel injected V-8. 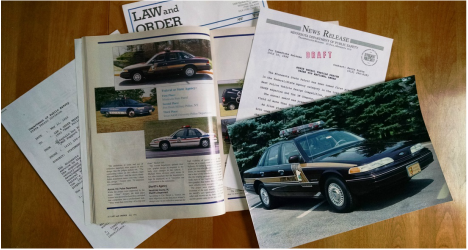 The new vehicle and graphics design won first place in Law and Order Magazine's 1992 Vehicle Design Contest. Trooper E.G. Carroll #261 in a photo submitted to Law and Order Magazine. Law and Order Magazine article showing design winners. For 1993, a chrome front grille and a reflector strip between the taillights were added on the Crown Victorias, now given the production code P71. The 1994 units were equipped with anti-lock brakes and for this year only, a traction control system. The 1994 models shared the 4.6 Liter V8 of the 1992 and 1993 model years. Also for 1994, a custom paint color was chosen; paint code EE. This paint code is still being used on the Fords today. Kevin Kittridge shown with a 1994 Ford Crown Victoria P71. Every now and then the Minnesota State Patrol is asked to test vehicles. Such was the case with the 1994 Pontiac Gran Prix GT pictured above with Trooper P. Schmidt. The State Patrol used 22 of these specially marked units, all of them white, provided by General Motors. The evaluations conducted and data collected from the cars were used by GM to develop new transmissions and other components. These units were unique in that there were no production Gran Prix GT sedans for the 1994 model year. At the conclusion of the test period, the cars were returned to GM and, presumably, dismantled. 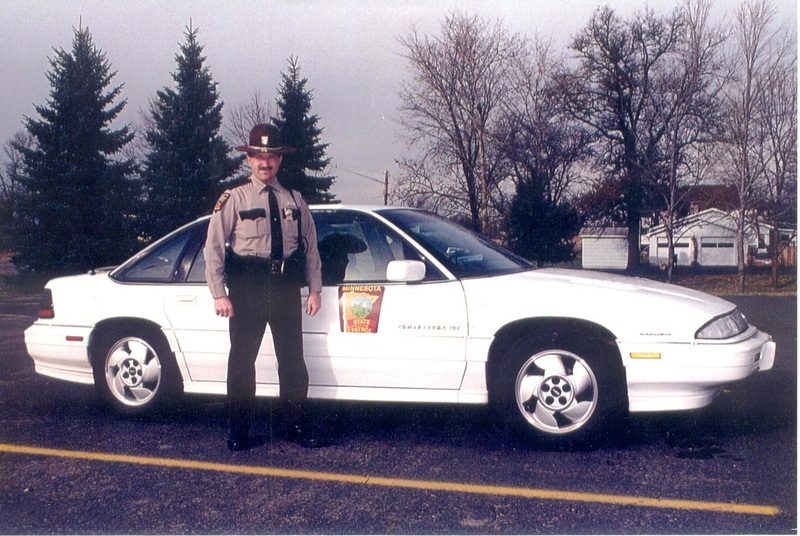 Trooper P. Schmidt #257 with a 1994 Pontiac Gran Prix GT. The 1995 Chevrolet Caprice 9C1 Police Package included the LT1 5.7 liter V-8 with sequential port fuel injection rated at 260 hp @ 5000 rpm and 330 lb-ft @ 3200 rpm; nearly the same engine as the Corvette. They used the 4L60E electronic 4-spd overdrive transmission and 3.08:1 rear axle. They were crazy fast high revving vehicles with phenomenal handling characteristics. And their digital speedometer was pretty cool, too. Ford redesigned the front and rear fascias in 1995, and the design carried over through 1997. After the 1996 model year, Ford’s Crown Victoria P71 became America’s only rear wheel drive police sedan. The 1996 and 1997 P71s looked nearly identical. The quickest way to tell them apart was by looking at the rear view mirrors. The 1996 units had color matched mirrors while the 1997 models were black. The﻿ Ford Crown Victoria was redesigned for 1998, now sharing all of its sheet metal with the upscale Mercury Grand Marquis. Ford continued to mak﻿e improvements to the Interceptor. Retaining the same 4.6 liter engine, improvements to the fuel delivery and ignition systems increased horsepower ratings to 230. 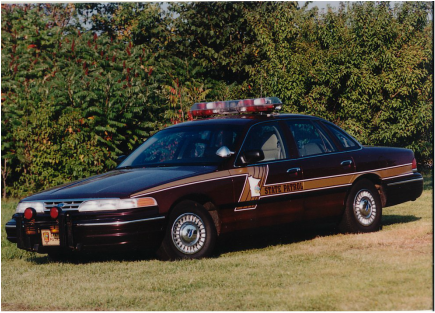 ﻿The 1998 police package P71 had a chrome grille, chrome door handle trim, chrome bumper strips, and a chrome-trimmed black rear fascia with "Crown Victoria" badge. 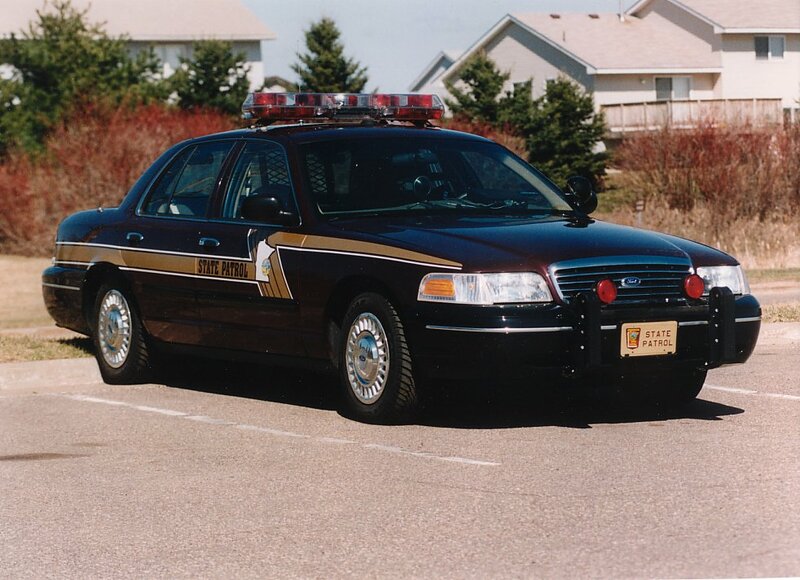 For 1999, Ford officially changed the model name to Crown Victoria Police Interceptor and changed the look of the car through the use of black trim. 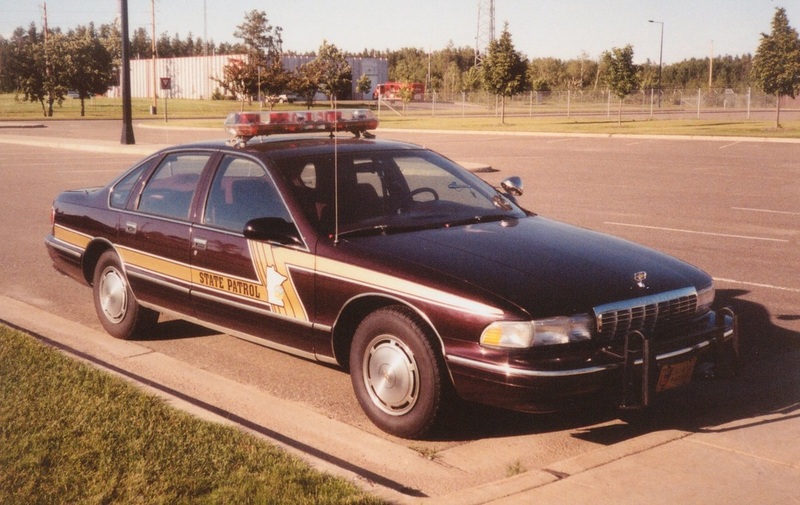 The new grille was black, as were the door handles and bumper accents.The rear fascia retained a chrome strip between the taillights and a Police Interceptor badge replaced the Crown Victoria badge. The units' 16" wheels were equipped with full wheel covers, which had the tendency to fall off with some regularity. This unit was retrofitted with hub caps and beauty rings. 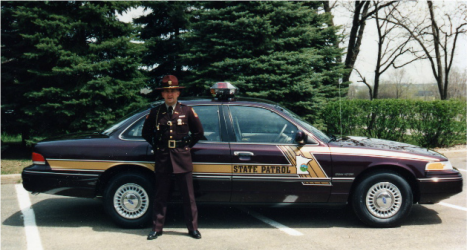 For 2000, the wheels on all maroon units would be adorned in this manner.